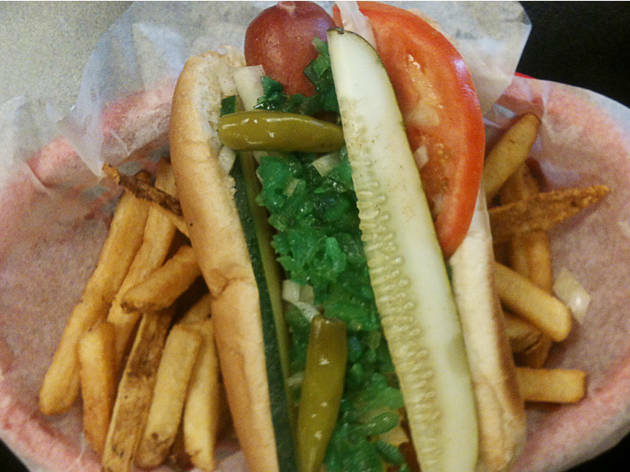 Hiding in the basement of a Lakeview building, the hot dog stand with the phallic rhyme-time name means business when it comes to ketchup prohibition. If you have the gall to ask for your dog with red stuff, the clerk will take your mugshot and stick it on the Wall of Shame. 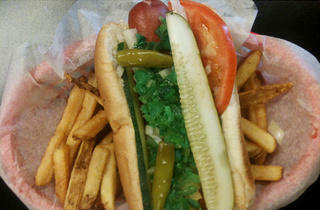 What you do want in your bun is a Chubby ($5.25), a plump, quarter-pound Vienna Beef with the Chicago-style works. As you eat, check out the children’s doodles of anthropomorphic hot dogs that paper the walls. Our fave: Hot Dog Elvis who's really worried about spilling condiments all over his blue suede shoes. El stop: Red, Brown, Purple (rush hrs) to Belmont; Brown, Purple (rush hrs) to Wellington. Bus: 8, 22, 36, 76, 77, 151, 156.